You rely on your air conditioner to provide comfort not only during the hotter months, but also during winter. Heavy usage during peak times can reduce the efficiency of your air conditioner and should be well maintained to ensure your system works at its optimal level. Servicing your air conditioner every year is the best way to keep it running efficiently. And now might be the perfect time to get your air conditioner ready for summer. If you haven’t been using your air conditioner much, or at all during the colder months it may have collected dust or leaves, or some of the parts may need a bit of attention. Many people don’t think about servicing their air conditioner until it fails. This can result in costly repairs which could have been prevented with regular maintenance. A well-maintained unit will ensure a reliable air conditioner for when the weather begins to heat up. So, making sure your air conditioner is summer ready can save money and reduce the risk of a breakdown when you need it the most. Speaking of saving money, a well-maintained air conditioner is much more efficient than one that isn’t serviced regularly. Regular services ensure that you air conditioner will run at its peak level which means it will use less energy than an unmaintained unit. This will result in you saving money in the long run, not only on your energy bills but also on possible costly repairs that may arise in a neglected air conditioner. A regular air conditioning service is also a great preventative measure. By checking all parts and making any necessary adjustments, this can prevent any small issues becoming costly repairs later on. Another benefit of regular maintenance is a healthier home environment. Many people are aware that they should clean their air conditioning filters regularly, however this is often neglected. Keeping the filters clean can also reduce dirt or dust build up on the condenser coil. Over time dust build up can restrict airflow making your air conditioner work harder, and as a result use more energy. Not only this, but dirty filters lower the air quality. You should clean your air conditioning filters at least every six months, preferably at the beginning of summer and winter to ensure optimal performance during peak times. While cleaning the filters can be a DIY job, there are other maintenance issues which should always be performed by a qualified professional. A maintenance schedule ensures that you air conditioner will continue to run smoothly and efficiently. Reducing the risk of expensive repairs while also saving you money. A well-maintained air conditioner works at it’s optimal level and will last longer than a unit which hasn’t been maintained. 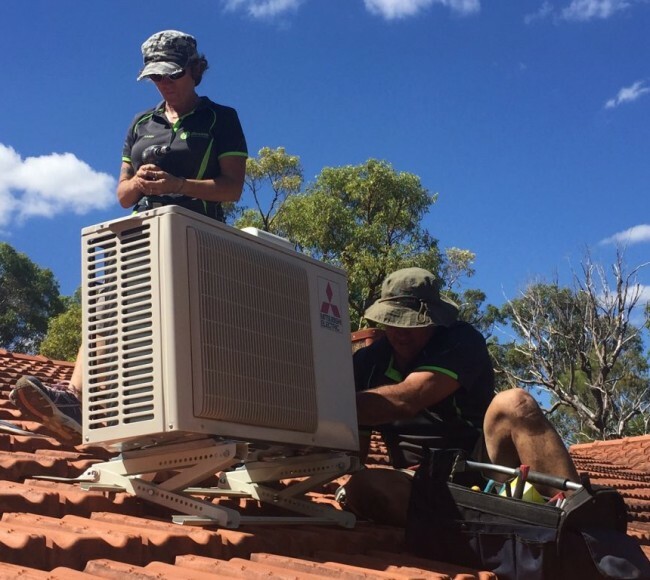 The team at iBreeze Air and Solar are the leading suppliers and installers of Mandurah air conditioners. Also servicing Rockingham, you will benefit from a professional and experienced team for all of you air conditioning service needs.